What will surprise the tourist arriving in Abruzzo for the first time is that in just a few kilometres, the landscape changes from sunny beaches to soaring Apennine peaks flanked by villages, castles, abbeys, lakes, Parks and Nature Reserves. The strength of the amenities on the Abruzzo coast is the sheer variety: large luxury hotels, family run boarding houses, B&Bs, an extensive network of rental homes, campsites and resorts. A flight over the Abruzzo coast would show us quite clearly how it blends quickly into the hinterland of rolling farmlands, set across rounded hillsides, and tended with age-old agricultural care. Farms and tiny towns can be glimpsed everywhere amongst cultivated fields and blossoming meadows; in the background, the powerful backbone of the mountain that runs parallel to the coast. The hillsides of the immediate hinterland and the coastal settlements provide equally interesting tourist facilities with country houses, agritourism farms, holiday rental homes and villas, excellent alternatives for enjoying both the sea and the countryside: these sites are often only a 10-minute drive from the beach, but are more economical and they offer the chance to get away from the bustling pace of the seaside towns to enjoy the quiet of the countryside and small old town centres. In proportion to the region’s relatively small surface, the coast seems endless: an astonishing 133 kilometres of beaches, washed by unpolluted waters and drenched in sun for months on end. 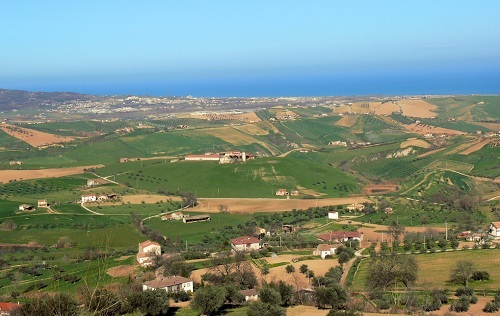 The Abruzzo coast includes the provinces of Teramo, Pescara and Chieti and it stretches 133 Km miles. From the river Tronto, which is the northern geographical and also historical boundary with the Marches, down as far as the Trigno, which marked the southern administrative frontier with the lands of Molise, the coast offers mile upon mile of wide sandy shores, steep bluffs and maritime pine groves. The characteristic feature of this shore is the variety, with settings and environments for all tastes. Most of the beaches are located in the province of Chieti and Teramo. In Pescara you can indulge in long walks in the Pineta d'Avalos and the protected Pineta di Santa Filomena. The landscape near the sea, made ​​up of hills dotted with villages, hamlets and farms, is very reminiscent of those typical of Umbria and Tuscany. 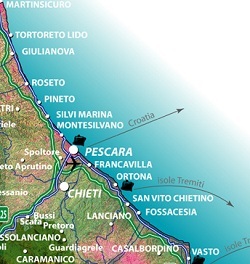 Further north we find the Pineto beach and Torre di Cerrano. Ideal for families who need adequate facilities, for young people and for the elderly who want to spend their vacation peacefully and comfortably. 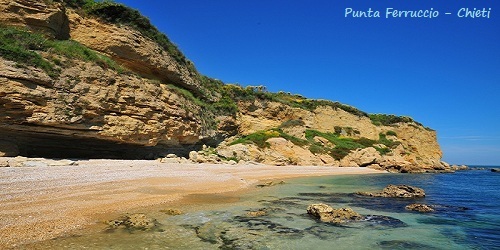 The southern coast is rocky near Ortona, soaring out of the sea in the picturesque cliffs of Punta Ferruccio, Punta Acquabella, Punta del Cavalluccio and Punta Aderci (or Punta d'Erce). The coast of Trabocchi (characteristic fishing machine on stilts) corresponds to the stretch of the Adriatic coast in the province of Chieti, famous throughout Italy for its natural beauty and its diversity. Each of the towns and villages keeps its own characteristics and traditions. The Punta di Ferruccio is a promontory in the municipality of Ortona. The pebble beach stretches between two peaks of the tuff rocks that plunge into the sea, rich waters whose color assume the typical emerald green of the Adriatic, unfortunately, one of Abruzzo's most beautiful beach is in a state of neglect by local authorities. The tourist season opens in May and ends in September. Tourist facilities in the region offer an infinite variety of possibilities that will satisfy even the most demanding. Il lungomare (promenade), shaded by palms, pines and tamarisk, give an ideal atmosphere for long walks savoring il gelato (ice cream) mingling with the locals or indulge in ...amorous adventures. Marina Citta' Sant' Angelo is charming old town, where there is the famous collegiate church of San Michele, has a small outlet to the sea, between the mouth of the Saline and Piomba rivers. Montesilvano is connected to Pescara by a wide promenade lined with a beautiful sandy beach. The nightlife offers plenty of entertainment ranging from classic disco on the beach with piano bars and traditional night clubs to cafes and restaurants for a romantic dinner or eat ice cream. There are also many amusement arcades, pubs and local theme to listen to music and have a drink. 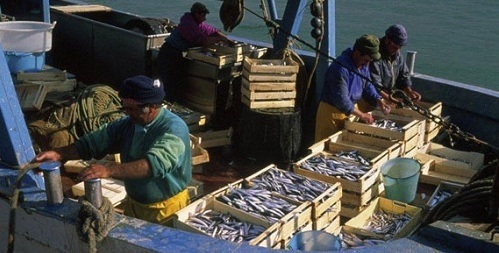 Life on the Abruzzo coast is a happy one, not only at night but also during the day.